The 2012 astronomical summer officially began June 20 at 6:09 pm in the northern hemisphere. Out of all the solstices, the summer solstice is my favorite. I think it’s because it’s the longest day of the year with the most hours of daylight. Summertime is laid-back, making everything more tolerable. It’s also the season of summer vacations. Looking back, I realize what a feat it was for us to have a two-week family vacation every year. My mother didn’t work outside the home and my Dad worked for NASA, which didn’t command the high salaries of the private sector. Granted, we didn’t have exotic vacations to Hawaii or Europe and we had the obligatory once-a-year-trek to visit family in Oregon, but we did get away for two weeks and we had fun. What I didn’t realize at that time was what a gift and feat it was for my parents to make that happen. As a single parent, I worked two full-time jobs to eek out a survival with my sons. If I did have some disposable income, I didn’t have the time and when I had the time, I didn’t have the money. Oh, I had vacation time when I worked for a church, but it was used when I had to travel for my business or to have yet another major surgery that was such a big part of my life back then. Being a complete Type-A personality didn’t help either. I don’t think an official summer vacation is on the horizon for us this year. Instead, we’ll get creative and find some local things to explore. That’s one great thing about being a transplant to an area. Everything is new. I’m also going to scatter some summer vacation stories in this blog. I’d love to hear some of your favorite memories of summer vacation. Let’s spread some summertime joy! 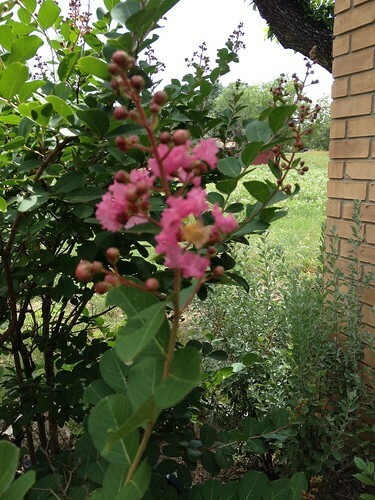 The crepe myrtle bush pictured at the beginning of this blog post always blooms on the first day of summer. This is the second year we’ve had this bush and the second time it’s bloomed on the first day of summer. Everyone else’s crepe myrtle has been in bloom for weeks. Odd.